Very unique. I like it. 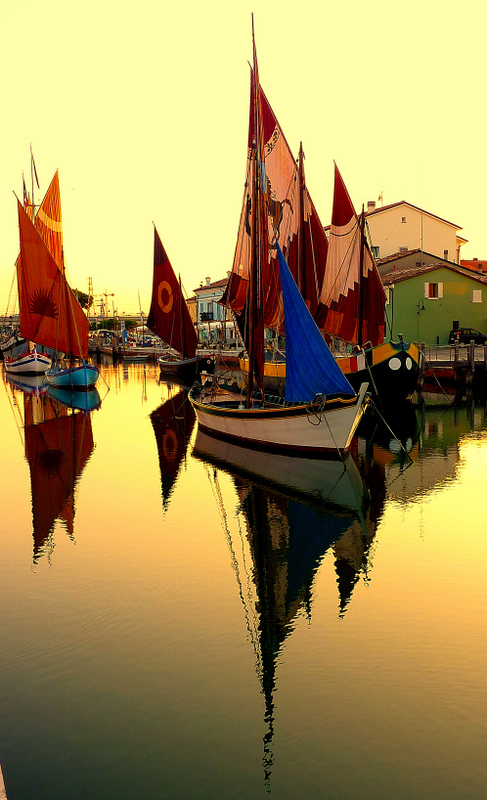 v.
Very sweet and beautiful sunset image of harbor. It has also excellent composition. I love this peaceful mood and color! V! I have to add my name to this long column. This is one of your best. Its all about the reflation...love it! Gorgeous... beautiful colors and lightness feeling. One of the best "Windjammer" images which I saw. Of course there is no wind, what paradoxically is precisely the main ingredient for the making of this scene! Impressive is also the perfect choice of the perfect camera for the occasion. We like the Lumix series, we have used them for years, and regularly exchanged them with more recent models to be up to date with the sensor technology. Such exquisite images show how far the Lumix has gone. They have become a recognized serious tools for serious results. Hard to choose from among so many great photos, but this is my favorite. Wonderful shot. Love the refection . Wow! This sunset is really sweet. Wonderful colours!! What a stunning shot Barc. GMV. Watching this photo, you can almost feel the warm summer air at the end of the day. Great catch. Beatiful light and colors! Excellent! A masterpiece of color...my compliments. Exceptional work. fantastico , me encanta .v. excellent image with great lighting, composition, reflection...well, the list goes on...everything...just love it!!! Magnifico !!! It has all been said perhaps, but this is a wonderful atmospheric shot, glorious light, and amazing colours. V.
Excellent shot with warm feeling! Excellent reflection, nice colors, warm lights. Fantastic picture. Great composition and colors, nice work! Wow!! A very beautiful image. Great job. V.
I see I commented before, I just want to add (Perfect shot). About 2 months ago I got a Pano- DMC-ZS3 and I love it. Amazed what it can do. You are right it is not about the camera, it's about the one who holds the camera. Either you see the shot or you don't. The camera can't tell you what to shot or how to shot it. This is a great composition! I like the reflection! :) V! Bellissima luce e colori. VV! Outstanding sunset, brilliant work. v.
Very special color in the water, and interesting composition. An outstanding and very, very beautiful scene. The water is so calm and the composition so beautiful.BV!! This is an amazing, colourful composition. Tons of atmosphere. Superb. Marvelous bright colors in beautiful warm sunset colors. Despite the still calm here, the image is incredibly stiking and projects so much energy. Very nice! Magnificent! Love the lighting & compo. V.
Oh, how I dream of summer. Beautiful atmosphere, great colours and quality of light. Exquisite image, fantastic colors. V.